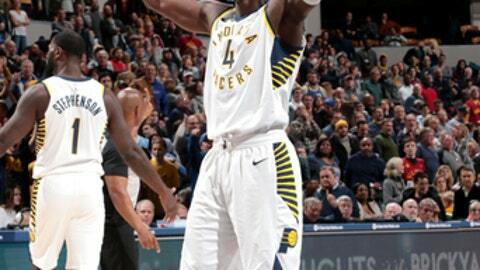 INDIANAPOLIS (AP) Victor Oladipo is enjoying his return to Indiana. Oladipo, who starred in college at Indiana University, had a career-high 47 points and added seven rebounds and six assists to lead the Pacers to a 126-116 overtime win over the Denver Nuggets on Sunday. The Pacers trailed 114-106 with 2:54 remaining in the fourth before scoring eight straight points, capped by Thad Young’s putback with 5 seconds left to tie it. Then, Indiana got the first nine points in overtime to secure its fourth straight win – all at home – while outscoring the Nuggets 12-2 in the extra period. On a night where most will remember all the baskets Oladipo made, the most crucial of his plays came with his drive to the basket with 7 seconds left that pulled defenders away from the rim and allowed Young to tip in his miss. Myles Turner finished with 24 points and eight rebounds, and Lance Stephenson had 12 points, six rebounds and six assists for the Pacers. Oladipo’s made six 3-pointers with the biggest coming with 2:10 to play in the third quarter to give Indiana its first lead of the game. Wilson Chandler keyed a hot start for Denver by scoring eight of the Nuggets’ first 10 points on the way to a 35-22 lead heading into the second quarter. And that deficit grew. Indiana trailed by as many as 19 in the second quarter after a slow start on offense. But the key moment of the game came near the end of the first half when the Pacers hit their stride, climbing back into the game with a 21-8 scoring run to head into halftime trailing 66-59. Trey Lyles led the Nuggets with a career-high 25 points, Gary Harris and Will Barton each had 21 points, and Chandler finished with 18. Oladipo scored 20 points or more in 19 of Indiana’s 26 games this season, with his latest effort marking the 18th time he has led the Pacers in scoring. Lyles and Harris are two of the most recent well-known Indiana prep stars to make it to the NBA. Lyles (Arsenal Tech High School) and Harris (Hamilton Southeastern High School) made what will be their only trip back to Indianapolis this season. Harris (Michigan State) and Lyles (Kentucky) were highly sought after recruits during their time in high school with Lyles winning a state championship his senior year. On Sunday night the two combined for 46 points. Nuggets: Paul Millsap (left wrist) and Nikola Jokic (left ankle) were held out of Sunday’s game. … Denver is now 3-10 on the road. . Denver’s 19-point lead marks the largest blown lead in a loss by the Nuggets this season. … Denver’s 66 points at halftime were the most first-half points scored against the Pacers this season. Pacers: Darren Collison missed Sunday’s game due to a sore left knee. … Since snapping a four-game losing streak Nov.10, the Pacers are 11-4. … When the Nuggets host the Pacers on April 3, Indiana will try to win in Denver for the first time since 2007. The Pacers have lost eight-straight road games against the Nuggets (seven in Denver, one in London). Pacers: Host Oklahoma City on Wednesday night, when former Pacers forward Paul George is set to make his first return to Indianapolis.